Ellana Cosmetics has been part of my life for almost a decade now. I remember discovering it when I was still in college (around 2008-2009) and falling in love with the fact that their mineral foundation was so pigmented and long-wearing for the price. It’s the foundation I wore on my graduation! I’ve tried so many of their products since then, and eventually, I got to meet the founder Theresa Carbonel-Buenaflor and her husband, Diego around five years ago. We’ve worked together but most important to me is that we’ve become friends who randomly hang out to catch up. I love them because they’re possibly even nerdier than I when it comes to makeup. We can talk about products for hours! To this day Theresa is still in charge of the formulations for Ellana; every single product goes through her from concept, ingredients, testing, packaging - everything. She’s a makeup artist so she knows what works in the real world, and has dedicated herself to creating a makeup line that has what Filipinas want and need in mind. In fact, Ellana is the only local brand with not three, not five, but TEN foundation shades for light to deep Filipina skin. Until this day I use their Hazelnut Latte foundation! This is why it’s only natural for a Project Vanity and Ellana collaboration to happen. It’s something that people always ask me about, and something that Ellana customers have been requesting for so long. Here’s what we came up with! The Project Vanity x Ellana Life-Proof Eyebrow Gel (P499 / 4 grams) is the ultimate solution to thin, unruly brows that are so oily and sweaty that only a few products stick. It’s a gel-type pomade that glides on smoothly to create perfectly sculpted eyebrows that still look soft and lovely. You can apply it then forget about it because once it sets, it’s basically there until you use a makeup remover to wipe it off! The formulation is fairly water-proof and smudge-proof once it dries. 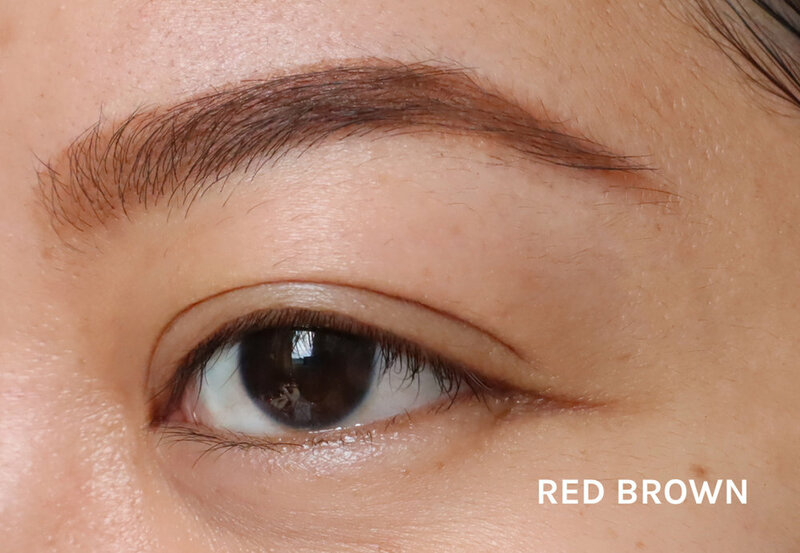 Light Brown is the shade you need for soft, natural brows. It has a blonde undertone to enhance that feathery look. This is a universal shade that can work for all hair colors and skin tones. Red Brown is perfect for those with dyed hair. It also helps to warm up the skin even if you don’t have colored hair; just mix it with Dark Brown and you’ll have a nice nutty color that brightens the eye area. This can also be used as a cream eyeshadow! Dark Brown is a deep taupey shade that can be used as an all-over brow shader with a light hand. It’s also meant to be used as a “contouring” shade to create a 3D effect, or as a shade for stamping on eyebrow gaps if you already have full brows. Bonus: it may also be used as eyeliner! Just be sure to prime your lids and use it on top of a powdered eye surface. Each shade can be applied with a light hand for a soft overall finish, or with a heavy hand for on fleek brows. It also allows for enough time to blend out any mistakes or harsh lines with a spoolie, so that you don’t go out with cartoon brows (unless you’re going for that look of course!). The formula also contains marula oil, a super oil that helps to nourish brow hair. The eyebrow gel is also paraben-free, fragrance-free, and cruelty-free. What I love about doing collaborations is the freedom I get when it comes to co-creating the products. The packaging is acrylic, so that it’s light and you can carry it around in your makeup pouch anywhere. While glass jars are more luxe, I personally don’t bring them with me when I’m out! The cap of course is the Project Vanity pink + logo in matte metallic finish. As for the box, the print is my floral watercolor painting. <3 So cute! I hope you love this collection as much as I do. We’ll be having a launch event for everybody soon, so please save the date on November 23! This is a meet and greet and live demo, and we’ve got freebies for everybody too. Stay tuned for the final announcement. Thank you for the support, as always, from the bottom of my heart. I would also like to thank the Ellana Team for your trust, and to the Project Vanity Team who tested the shades and helped with the name and concept. I’d love to know what you think of this collab!